Valorose Tutus and Textiles make Tutus and also sell all the materials you require to make your own. 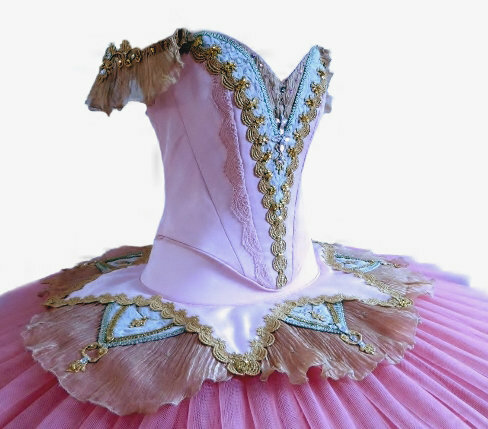 The construction which goes into a Professionally made Tutu is unique and requires various skills of a designer and manufacturer to achieve this. A fully embellished Classical Tutu can take up to three weeks to make, sometimes longer depending on the decoration. Which ballerina doesn’t dream of one day wearing a Tutu on stage. Although if you ask one, they will say how uncomfortable they are to wear and how much practice is needed to get used to dancing in one. When being partnered the man cannot see his partner’s feet let alone having to get used to being scratched by yards of net. If there are any misplaced decorations on her Tutu they can cause broken fingers and costume malfunctions. When a Tutu is being commissioned for a Classical ballet there are various factors which come before the ballerina wanting a pretty colour or design. The Role of the ballet being danced most of the times dictates the style. The Height of the dancer can dictate the length of the skirt. Whether or not she is being partnered also dictates the decoration and length of the Tutu skirt. Then the Choreographer wants a specific look which might clash with the Producer of the ballet. The budget also plays a role. Lastly the designer and maker has to try and achieve what specifications they have been given in a practical way. Tutus are made to last 20 or so years and the initial investment is paid for many times over. They get refurbished over the years and adjusted continuously to fit various dancers. The correct manufacture of a Tutu is extremely important and takes years of skills and knowledge. But it is definitely worth those weeks of work to see your Tutu finished, fitting properly and being danced in. My Salmon Pink ‘Aurora’ Tutu above was wanted with an unusual salmon pink net which was only possible to achieve by dyeing the net. I dye Tutu net to Customers specifications in the Tutu size they want and hold some stock of colours in demand at the time. Depending on my schedule the cutting, dagging and dyeing of a 10 layer Classical Tutu will take about 5 – 10 days. Please Contact me for up to date information on the time needed. Information on the designing and making of your Tutu is available in the Tutu section on the Menu bar. A commission of a Tutu is a commitment for both the Dancer and the designer. It is an intense time and needs a few months to fit different schedules and Toiles and Fittings in. The choices of fabrics and end design can take weeks to decide on before the work can even begin. So please allow for as much time as possible in the placing of the order to when the Performance or Rehearsal dates are scheduled.